I had every intention of sleeping in yesterday and being mildly lazy since I'm still feeling under the weather, but it turned out to be a rather productive day. I woke up even earlier than I usually do during the week after having a really wonderful dream, so I had to grab my notebook and write down every detail I could recall before they disappeared forever. It was extra remarkable to me because I haven't had any detailed dreams in a very long time. I used to have extremely vivid dreams quite frequently, something I always believed to be linked to my binge eating and especially to late night eating: going to bed with my stomach full meant my body would be working while it was supposed to be resting, and my brain was just doing its part to keep active. This time I wasn't snacking before bed, though, so I'm very happy to know that my vivid dreams aren't extinct due to my decision to live a healthier life. And oh, it was nice to dream! I've missed it. After writing my dream down in my paper journal, I finally got an idea for what sort of challenge I could do with Lesley - we both weigh about the same, so I've been trying to think of some sort of friendly competition we can do. It finally hit me: it's about 16 weeks until the first day of summer, and we both weigh in the low 230s. So we're racing to get to onederland by then! I'm very excited, and I think a little competition will be good for both of us - especially since here, we both win! At the same time, though, I'm a little nervous; the idea of having a 1 out in front of my weight is unfathomable to me. Last summer, I was 345 pounds - but this summer, I'll be under 200. I'm already thinking about how to mentally prepare for the triple digit transition - 3 to 2 was tough, so 2 to 1 will likely be even harder. I haven't been under 200 pounds since I was 12 years old and in middle school! So I'm hoping that the challenge will help me ease into this new phase a little. After sharing my idea with Lesley, I put together some things and headed to the post office, a necessary chore I've been putting off for weeks. I got international postcard stamps for sending more cards through Postcrossing! Then I headed to the salon to get my eyebrows waxed (beyond necessary, yikes!) and from there I went to a thrift store to see if there were any books I couldn't live without or any of the vintage Pyrex that I love - nada. From there to the grocery store, and from there to the gym, and finally back home to have some dinner and enjoy a book on my Saturday evening. So I guess it wasn't a hugely productive day in terms of getting very important things done, but I stayed busy, and that always makes me feel good. Usually I spend Saturday mornings deciding what my new recipe will be, then I collect any ingredients I may need while I am out running my weekly errands. Yet in spite of how much I got done all day, I somehow completely forgot to pick out a recipe before I got to the grocery store. I am a neurotic list-maker, so this was not great. Everything was a possibility. There was a sale on small scallops, and since I've been really wanting seafood lately, I picked up a quarter pound of them. I figured I'd throw them together with stuff I had at home, but unfortunately, I forgot that my cupboards were mostly bare, and I ended up making a pretty random mixture of pasta, vegetables, shellfish, and spices. Looks may be deceiving - odd as it was, it was actually pretty good. 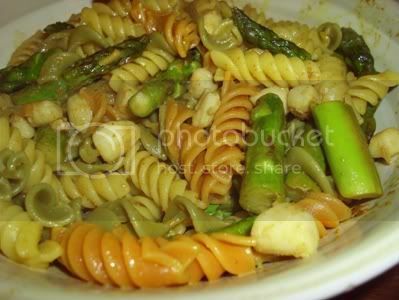 While boiling one cup of tri-color rotini, I cooked six or seven broken up spears of asparagus in a tablespoon of olive oil and two teaspoons of an Indian spice mixture my mother got me for Christmas. When the asparagus were cooked but still a little firm, I took them out and cooked the scallops in the same spicy pan, then readded in the asparagus and then the cooked pasta. Tossed it all together, and voilà! Delicious. This isn't a recipe that'll win any awards any time soon, but it's so versatile that you could do pretty much anything with it. What about you? How would you make your ideal "pasta whatever"? Pick a pasta shape, vegetable, protein, and spices, and let me know - I'm always looking for new ideas! My FAVOURITE pasta dish (which I made the other night) is small shell noodles, feta cheese, Garlic Plus spice (it's made by Club House) and lightly tossed in olive oil. Obviously this isn't the most healthy on it's own, so since it's greek themed, it's nice to add peppers and onions. As for a meat, some chicken would be good, but I generally would eat the protein on the side (like a piece of fish or something), as the actual pasta dish tastes best by itself. I think that challenge will be nice and healthy!! Yesterday I left my house before 1pm and didn't get back until almost 8pm. I went to the gym and then shopped until around 8pm I think I burned more calories walking around in the mall than I did at the gym! My friend canceled on me because of a personal problem, but ended up calling me later and my evening was ended with hanging out with her watching old episodes of Big Bang and then reading until it was wayyyy too late. I am so excited about this challenge. I haven't really appreciated what you have gone through from your 3 to 2 and now 2 to 1, since i've only lost 25lbs, but i am about to move out of the comfort zone that i have been in since the end of my last (live-in) relationship. It will be a big one for me, as i have been in that 'comfort zone' for a while. My fave pasta recipe has got to be a nice simple one. Spray oil your pan, add red onion, onion, lots of garlic and cherry tomatoes. Let that caramelise whilst you boil your pasta (ideally spaghetti or a long pasta) then mix pasta and veg together, along with two slices (per person) of goats cheese. Let it melt slightly, then season (plenty) and serve. MMMM, a fave with everyone in my house. Yum, I love seafood. That looks delicious. Also - I LOVE the challenge to race to the 100's, and I can't wait to keep up on you success! :) Great job!! 1. Rotini, chicken, kale, peanut butter. 2. Fiori, tuna, tomatoes (canned or fresh), spinach. I saw your guest post today and wanted to say hello...I'm just beginning my journey, again, and am trying to surround myself with others who are on their own journey. I totally forgot until I just saw a link on lucid dreaming that I meant to address this yesterday and then got all sidetracked with pasta. My boyfriend is a lucid dreamer and he phases in and out from lucid dreaming. He finds that he dreams a lot more when his life seems to be balanced and normal... so perhaps because you've changed up your routine so much and are always in transition - it has resulted in you not dreaming as much as you used to. I'm sure once everything settles down you'll find yourself dreaming more!